The Roulette Wheel quilt block is a four patch that can be a bit more of a challenge than many other blocks. I say this only because even though the block is constructed with several half square triangles, not all of those triangles are made into squares, as is the norm. As a result, the construction is a little different. Now, having said all that, there is nothing difficult in the process of making this quilt block. 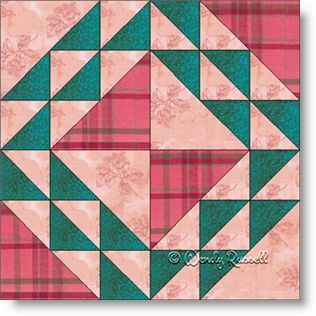 The only caution is that you handle the triangle pieces with care to avoid distortion, as many of the individual parts of the block leave the bias edge exposed until that edge is sewn to the next piece. The sample quilts illustrated give you some ideas of how to make the quilt with your own personal touches, by adding extra blocks, or changing up the quilt setting. Enjoy!